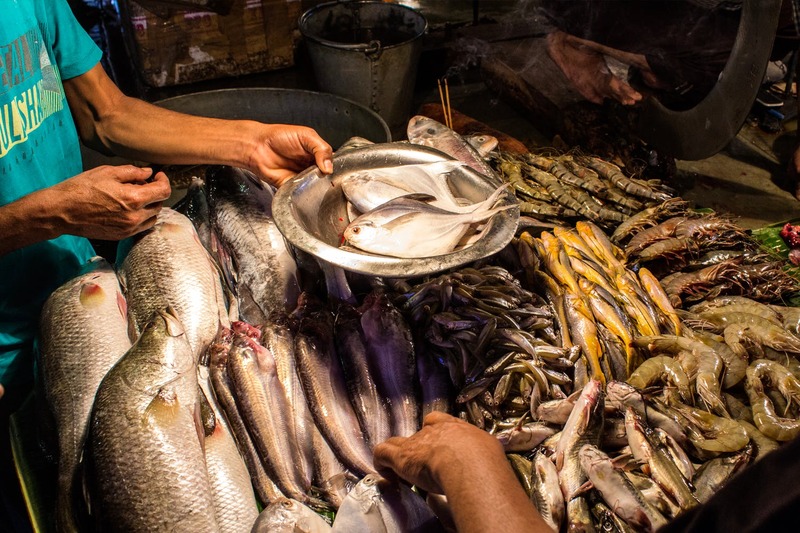 In Kolkata, where fish and seafood represents a huge chunk of the local culture and economy, fish markets are an essential stop if you want to gain a true sense of the local culinary vibe. Although there is a ‘maacher-bajar’ in every neighbourhood, we bring you all the dope on where to get the freshest fare in town. Here the party of fins starts as early as 5.30 am. Although North Kolkata may seem a bit out of bounds for some but would you let a bit of distance get in the way of procuring a wide variety of freshest mourala, puti, bele, bata,koi, singhi, magur, papda and ilish? This market is one of the oldest roofs that serves as a one stop shop for everything ‘fillet’. You can even get your hands on locally caught species, including carp, catfish and prawns. The air filled with an impermeable smell of seafood, a tad too overcrowded and definitely not for the faint at heart: Welcome to one of the largest fish markets in the country! Get lost in the huge maze of fishmongers serving up over 1000 varieties of fish incurring a turnover of almost 10 crore a day (gulp!) The hype of the taazi machli is vouched for when you go home and bite into the first slice of paturi as it takes over your senses. Adding another feather to its cap, this market is perhaps the only one in the country to remain open for more than twelve hours from 4am every day. From north, lets head to the south where the Gariahat Market is bustling with people flocking here for a good variety of fresh seafood. Be prepared to get hugely entertained here as you go about your shopping with shouts of animated bargaining and choicest of abuses flying around as customers haggle with vendors to get the best prices. During the hilsa season the prices soar up to INR 1,800 a kg but you can be rest assured of the quality you are taking home. Row after row of fresh produce will leave you spoilt for choice. If you don’t keep your impulses in check then you might end up buying ‘too maach’ (more fish than you can stomach!). Also known as the Nagendra Bazaar Fish Market, it is most popular for selling fish at much cheaper rates than the rest of the markets in Kolkata. Boasting of being the biggest wholesale fish market in South 24-Parganas, it is popular for different varieties of prawns which are sold at least INR 100-150 cheaper than most markets. Tangra, Bhetki and Aar are sold between INR 280 and INR 300, which is at least INR 80-100 cheaper than their normal price. Your wallet will thank you at the end of this shopping spree. Welcome to seafood heaven! Located in East Medinipur and right near the sea, the vendors come very early in the morning with heaped carts of freshly caught sea creatures. Although this market is off the city map, however your search for the best fish stops here. Malai chingri on your mind? The tiger prawns, shrimps, lobsters, crabs and kingfish available here are to die for.